How Do I Keep Stress From Making Me Feel So Bad? Luckily, that doesn’t have to be true. In fact, stress can make you healthier and happier. 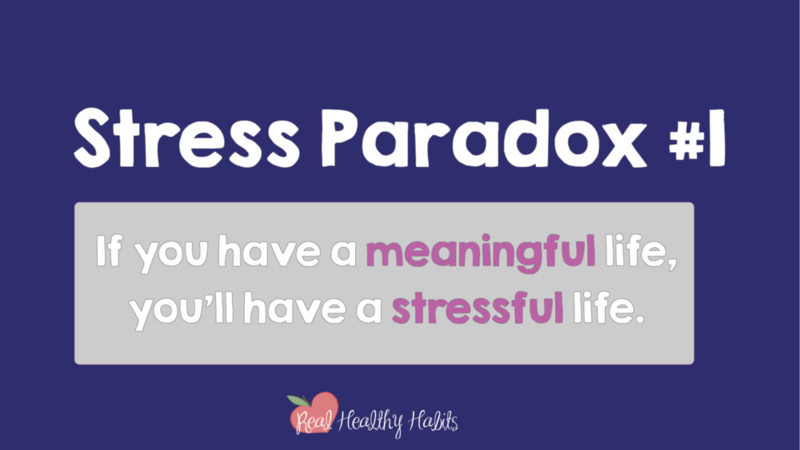 All thanks to Stress Paradox #2—Stress can be Harmful or Helpful—you choose which one. Amazingly, stress can have both effects—good or bad—it just depends on which one you believe. You can’t always get rid of the stress in your life. But, don’t worry. 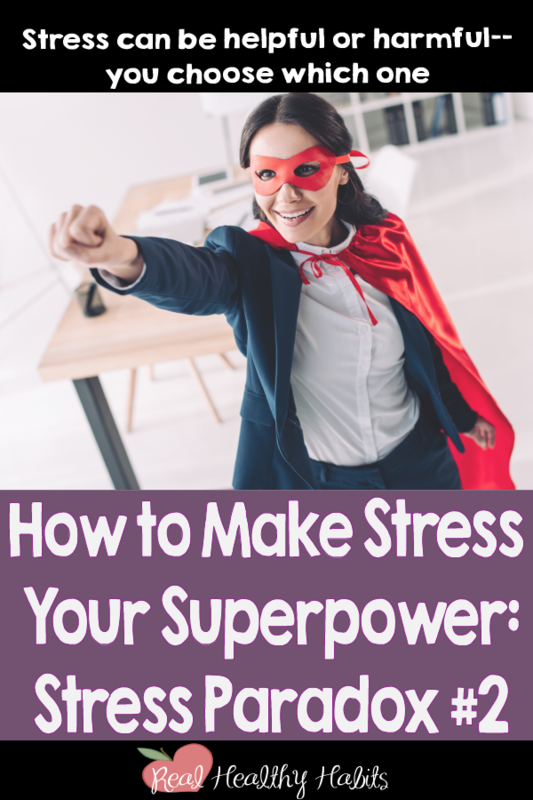 You can use the How to Make Stress Your Superpower series to get great at stress. DIY your stress with this series, or you can get help from me 1-on-1. Whichever option you choose, you can finally master stress. Stress is bad news. It makes you sick, tired, and can even kill you. BUT, What if there was an alternate reality, where stress could be good for you--great even? Good news--That reality already exists! To tap into its power, you need to learn Stress Paradox #2. So last episode we talked about Stress Paradox #1. Now we're onto Stress Paradox #2. Now pay close attention to this. This episode's info can even save your life. Now on to Stress Paradox #2. Well, if you think this, you're right. I saw an article just this week that said that workplace stress was so bad that it causes 120,000 deaths every year. That means it kills more people than diabetes or kidney disease. But, before you get all bummed out, remember there's a Stress Paradox #2. You see, what makes people sick or even kills them, isn't the stress. Remember, stress equals meaning. What's dangerous is the combination of stress plus believing that stress is harmful. Then the researchers waited… and they waited…. and they waited. Then, eight years later they checked to see who had died. And, people who had high stress—they increased their risk of dying by 43%. No surprise there. BUT, that was only for people who thought stress was harmful. Wait, Stress is Helpful Too? You see, some people didn't get the memo. They thought stress was helpful! And, those starry-eyed dreamers, they had the lowest risk of death of all— even compared to those who had super low stress. They also had less depression. They were more satisfied with their lives. They had fewer health problems. They were happier and more productive. They saw circumstances as challenging, not overwhelming. They were more confident in their coping skills. And, they were better able to find meaning in hard stuff. That's a lot of helpfulness! That's what everyone figured, but it just wasn't true. The people who thought stress was good—they did actually have stressful lives. It turns out believing stress is helpful works whether you have a lot or a little of it. So, basically you can believe two different things about stress. Stress is harmful, or stress is helpful. And, it turns out both of them are true. Alicia Crumb PhD, a well-known researcher on mindset, explains what's happening here. This is a case where what you believe becomes a self-fulfilling prophecy. Those who believe stress is helpful, cope with it. And then, good things happen. Those who believe stress is bad— they avoid it. They might escape or distract themselves from stress instead of just dealing with it. Now here comes that lifesaving info that I promised. It's time for you to sit up and really pay attention. Remember that eight year study where the researchers waited around to see who died? Well, they estimated that over those eight years, 182,000 people may have died prematurely—just because they believed stress was harmful. A while ago, a friend was going through a really tough time adjusting to her new job. Well, I scolded her, “Don't ever say that again! Then of course, I calmed down. And, I told her that she could believe her stress was helpful instead— and not end up dead in the process. So what secret knowledge of stress did I share with my friend? How do you actually believe that stress is good for you, and then make it your super power? Tune into the next episode to find out how. Want to DIY Getting Better at Stress? If you need a little help with reframing your stress and getting good at it, check out my video/ blog post series. Next week, I’ll teach you what stress really is, so you can learn How to Make Stress Your Superpower. We’ll map out your customized health and stress habit plan together. With the Real Healthy Habits 6-week jumpstart program, your definition of health and stress management success can finally be a reality. I want to give a big shout out and a high five to Kelly McGonigal, PhD, the author of The Upside of Stress: Why Stress is Good for You and How to Get Good at It. I read stacks and stacks of books on stress trying to figure out what to do about it. Kelly’s book was the only book that gave me hope and a true mindset shift that stress could be my superpower. I hope that I’ve done (so many of) her ideas justice. Hi, I’m Treva, and I can help you feel amazing again. I'll help you develop a health habit plan that is personalized for your body, your preferences, and your lifestyle, and then I’ll coach you until it’s all on auto-pilot.